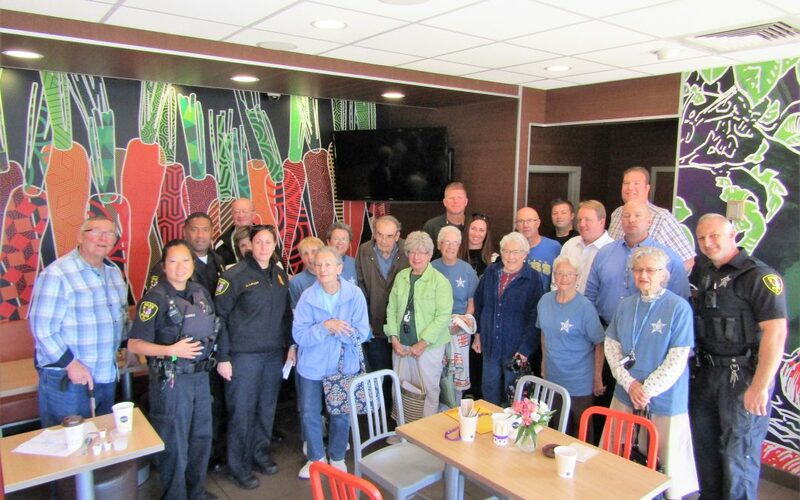 On Wednesday, September 6th at the Elgin McDonald’s, located at 1165 N McLean Blvd, officers from the Elgin Police Department and community members came together in an informal, neutral space to discuss community issues, build relationships and drink some delicious McDonald’s coffee. Coffee with a Cop provides a unique opportunity for community members to ask questions and learn more about the department’s work in the Elgin neighborhoods as well as have a chance to get to know the Police officers on a more personal level. Officer Lalley led the discussion and all officers in attendance introduced him or herself and explained to the community members exactly what their role is on the police force. Many topics were discussed. Among them were the Family Finder Program, Drones, The Resident Officers Program, as well as the many ways the Officers are involved in the Local Schools. The residents in attendance were able to interact and ask questions for the Officers to answer as well as voice any concerns they had. The Elgin Police Department Host Coffee with a Cop often and at various times and locations so that all community members have a chance to attend these meetings. A special thank you goes to Administrative Bureau Commander, Ana Lalley who coordinated the Coffee with a Cop event, as well as all the other officers that came and served coffee and mingled with the community. The event was courtesy of the Elgin McDonald’s Owner/Operator, David Bear. To set up an event contact the Elgin Community Relations Director, Julie Travers at julie.travers@comcast.net.